I'm sure you have heard by now that AutoCAD 2007 has gotten a major overhaul in its 3D Modeling capabilities. These changes wouldn't make much difference if they didn't improve lighting, materials and rendering as well. In this posting I take a look at some of the new lighting improvements at a very basic level. 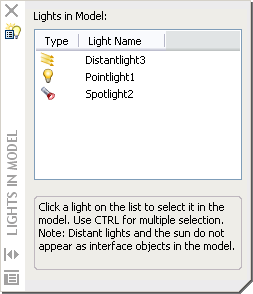 AutoCAD 2007 supports 4 different types of light sources (5 if you are going to count default lighting). The four different types of lights are Point, Spotlight, Distant and Sun light. Point, Spotlight, and Distant lights were all available in previous releases of AutoCAD that supported rendering (all the way back to R13). Point lights are lights that emit light in all directions, and are similar to a candle or a common household light bulb and as the light moves further away from the source it gets dimmer. A spotlight, would be similar to a flash light as it emits in a specific direction and as the light gets further away from the source it gets dimmer. Distant lights are lights that emit light along a specified vector, but the light does not get dimmer the further away from the source that it gets. 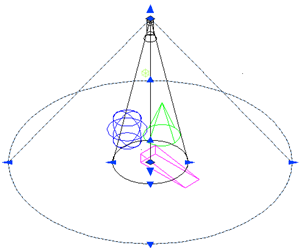 A distant light would be similar to the sun, the angle and direction affects how the light is emitted. Sunlight is really a specific distant light that allows you to control the time and day of the sun, and its position through longitudinal and latitudinal values. 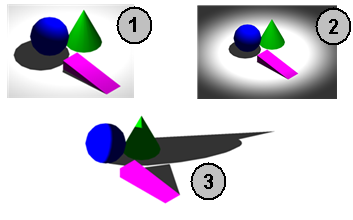 All lights can be selected in the model using the Lights in Model palette or in some cases light with the point and spotlights can be selected and manipulated directly in the model using grips. That is about all the time I have for now on lights, until next time. I just recently read through AUGI 's Top Ten Wish List for AutoCAD and noticed that number 8 on the list can be achieved with AutoCAD 2007 using the Customize User Interface (CUI) editor. The number 8 with is to be able to double click on a dimension to open the text editor. By default double clicking on a dimension opens the Properties palette which is nice, but in some cases not exactly the designed outcome. AutoCAD 2007 introduced the ability to edit the action that happens when you double click on an object in the drawing window through the CUI editor. I have included the steps to do this, and if you want to do something other than open the Properties palette or start the DDEDIT command you can create a custom command or AutoLISP file to use instead. Start the CUI editor, click Tools >> Customize >> Interface or type in CUI at the command prompt. In the Customizations In pane, click the plus sign next to Double Click Actions. In the Command List pane at the bottom, look for the command Edit. Tip: Click in the Command List pane and press 'E' on the keyboard to jump to the commands that begins with that letter. You can enter more than one of the first letters of the command if you enter them really quickly to get even closer to the command you are looking for. Select the Edit command in the Command List pane and while holding down the left mouse button, drag the command to the Dimensions node (item) under Double Click Actions in the Customizations In pane. Release the mouse when Dimensions is highlighted to replace the Properties command with the Edit command. Open a drawing with a dimension in it or create a new drawing and add a dimension to it. Double-click the dimension object and the In-place Editor starts. For more information on AUGI's Top Ten Wish List for AutoCAD visit AUGI.com. AUGI is one of the best peer-to-peer sites out there for Autodesk products. 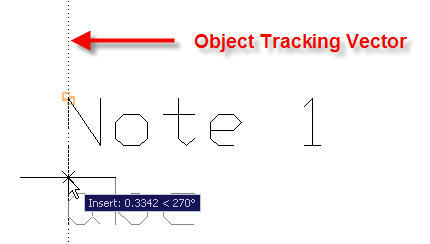 Mail Bag - How do I rotate the crosshairs in AutoCAD 2007? Just recently I have received an e-mail about how one could rotate the crosshairs in AutoCAD 2007. The user said he was able to do this in AutoCAD 2006 with easy, but was not able to do this easily in AutoCAD 2007. Being curious about this issue, I set out to find out what is different between the two releases. 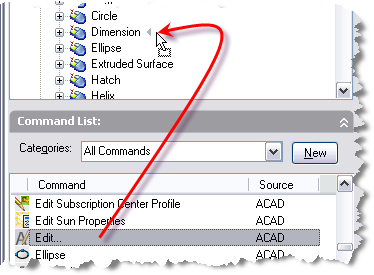 Well in AutoCAD 2007 the Snap and Grid tab of the Drafting Settings dialog box has been revamped and in the process the option to change the Snap Angle has been lost between AutoCAD 2006 and AutoCAD 2007. Since this was the common way to set the value from the user interface you must now resort to using the system variable SNAPANG to rotate the crosshairs. Below is a procedure for changing the SNAPANG system variable. At the Command prompt, enter SNAPANG. At the prompt, Enter new value for SNAPANG <0>: type a new angle value and press ENTER. Got an AutoCAD or AutoCAD LT question you are look to have answered, send me an e-mail at [email protected]. 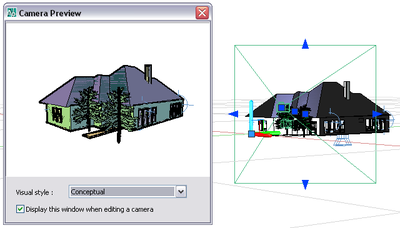 Like many of the 3D features in AutoCAD 2007, cameras have gotten an update as well. Cameras are now accessible directly from the drawing window via a graphical object that does not plot by default. This allows you to make changes to the cameras location, its target and lens all via using grips. You are also able to change a camera's properties via the Properties palette. One other nice touch to the updates to cameras, is the new Camera Preview dialog box which lets you see what the camera sees as you are editing it with grips and the Properties palette.